Last week we discussed a few of the things that you need to take into consideration when deciding if you want to do a craft show. If you missed that post, please take a moment to read it and feel free to leave your thoughts and comments. 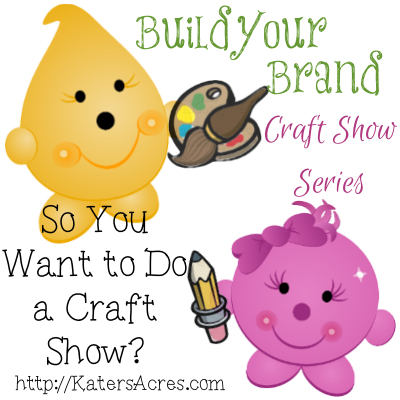 Today we are going to talk about your overview in preparing for a craft show. There are many things that need to be considered when deciding if and when you should do a craft show. In the previous post in this series, I outlined a few of those points. Today we are going to talk about the importance of having a general overview as you prepare for the craft show. Preparing for a craft show is hard work. If you are preparing at the last minute, chances are good it will look like you have prepared at the last minute. The majority of shows that I have attended or participated in, it is obvious to me who the people are that have planned ahead for their show. It is also obvious who the people are that care about the image that they are portraying. Remember, we are talking about your brand here. You brand includes not just your product, but you, your display, your color scheme, everything. You need to think about more than your product. Many craft show vendors make the mistake about thinking that their product will speak for itself. Let’s be honest, this is seldom true. It’s the same online: people who feature a single soap in their first photos, as opposed to someone who displays their soap on a dish with a loofah for their first picture will likely get less traffic that the store with the soap dish & loofah. Why? Because that store is making you want something: the perfect shower, a luxury shower experience, a soap that delivers. We call that marketing. Your pictures should say more than just your product. The same is true of your display at a craft show. If you make Americana themed party banners, setting them on an American flag tablecloth will likely not garnish you much traffic. However, setting up large posts strung with a few lights and hanging multiple banners in different examples, while a 8.5″x11″ portrait on your table displays a great party … who are you more likely to look at or buy from. Your brand needs to be loud and clear. The more simple (yet stylish & sophisticated) display you have, the more likely your product is to get attention. You don’t want your display to be so busy that people miss your product for your display. Be sure to keep your display area neatly organized and showing off your best products. A display that is overwhelmingly complex will have people missing your product and focusing on your display. The example at the right of Zooguu’s Booth was featured on Etsy … why? It is unique, fun, simple, practical, and most of all a definite attention getter! Allowing yourself to tweak, change, altar, add, & subtract while you plan for your show. Several days before ask a friend to visit and see what they see as the pros & cons of your display. What do you notice first: something you like or something you loathe? If you don’t like it, change it! Step to the other side of the room and make sure you have at least one visual element that draws the eye and adds interest. When in doubt, ask your hubby & kids to help and see what they notice first. Sometimes what looks good to your eye at the moment doesn’t look good in pictures. So start taking pictures from different aspect and angles and see what you really like & what you really don’t like. Then when you have finally settled on an eye catching design, take a final picture and get ready to recreate your living room master piece at your craft show. One of the most disappointing things is when I got to a craft show and see a vendor that I really like! They tell me all about their online store and how I can order online. But here’s the problem: often they forget to take business cards with them to their show and then I end up forgetting about them and not going to the internet to search for them. Or worse they are completely OUT of business cards! So many people forget to take (and display) their business cards in a prominent place. Please do not forget these and take 10x more than you think you will need. This is a great way for people to see and to network with you after a show. Here’s my business card holder without cards in it and filled with cards as it sits on my booth as well as a few different angles of my display from a Fall 2011 show. Read more craft show display tips on Etsy here. is a series of posts designed to help you succeed in ‘Building your Brand’ on Etsy and achieving online success through social media, blogs, websites, craft shows, and so much more. Join me every Wednesday as I give you some tips to try and help you achieve Etsy success and perhaps even be one of the lucky few who get to quit their day jobs and focus on their art/craft all day!